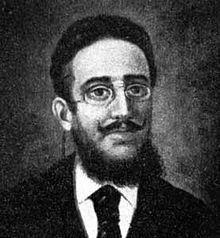 On this date in 1897,* anarchist Michele Angiolillo was garroted in Vergara prison for assassinating the Spanish Prime Minister. Angiolillo (English Wikipedia entry | Spanish) was an Italian expatriate in England who was so incensed by the procesos de Montjuic — a spasm of indiscriminate arrests and torture that followed an anarchist bombing in Barcelona — that he resolved to avenge the crime against his brothers. That named “Castillo” whose clutches rent so much flesh was the Spanish Prime Minister Antonio Canovas del Castillo, a statesman whose pioneering contribution to the art of manufactured consent was the turno system whereby two major Spanish political parties alternated turns in power/opposition and mutually connived to engineer ceremonial elections to that effect. Upon his shoulders rested responsibility for the Barcelona torture regime. And Angiolillo took it upon his shoulders to hold the executive to account. 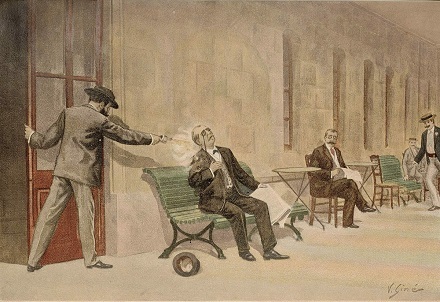 Slipping into Spain with false papers, Angiolillo found Canovas taking a restorative visit to the Santa Agueda thermal baths and shot him dead on August 8. His trial was undertaken within days, a mere formality considering that Angiolillo obviously shared the pride taken in his act by his overseas supporters. 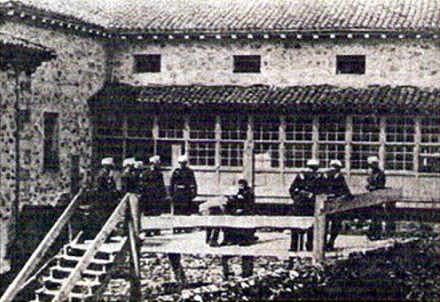 He justified the murder with reference not only to the torture and execution of anarchists at Montjuic, but of the execution of Philippines independence martyr Jose Rizal a few months prior. * There are some sites proposing August 19 or 21. Period press reports are unambiguous that the correct execution date is August 20. ** William Randolph Hearst’s New York Journal would publish a banner headline during the imminent Spanish-American War triumphantly asking readers, “How do you like the Journal’s war?” Its claim to ownership stemmed in part from Hearst’s relentless hyping of Weyler’s (very real) atrocities over the preceding years.